Full of majestic architectural monuments, priceless cultural treasures and cobbled pedestrian thoroughfares, Kraków's Old Town is the pride of Poland, one of Central Europe's most beautiful architectural showpieces, and one of the world's most popular tourist destinations. The most important Polish city to not come out of World War II looking like a trampled Lego set, the rich cultural and historical value of Kraków’s Old Town earned it well-deserved inclusion on the first-ever UNESCO World Heritage List back in 1978. Characterised by its unique upside-down teardrop shape - dictated by the city's former medieval defensive walls extending north like two encircling arms from Wawel Castle - today the Old Town is surrounded by the charming belt of public green space known as the 'Planty.' Standing in place of the city's medieval moat, the Planty draws a clear line around the original medieval centre of Kraków, within which you’ll find many of the city’s most spectacular sights. IYP’s Old Town Walking Tour leads you from near the main entrance of the city in the north - the historic Floriańska Gate - to Wawel Royal Castle in the south, via the market square and most important and interesting points in the Old Town. Known as the ‘Royal Route,’ this was essentially the historical coronation path of Poland’s kings from the 14th century to the very end of the 16th century when Kraków served as the royal capital. Our route includes a couple key detours, of course, and covers about 2km. If you’re only interested in the exercise, it could take as little as 30mins, but we reckon for most an exploration of Kraków’s Old Town will take several hours ‘if done correctly’ - that is, with a couple short culture, food and coffee/beer breaks. If you have only one day in Kraków, this is how you should spend it. Follow the linked venues listed below in exact order to replicate the tour on your own on your mobile device or tablet, or use the embedded pdf at the top of the page. 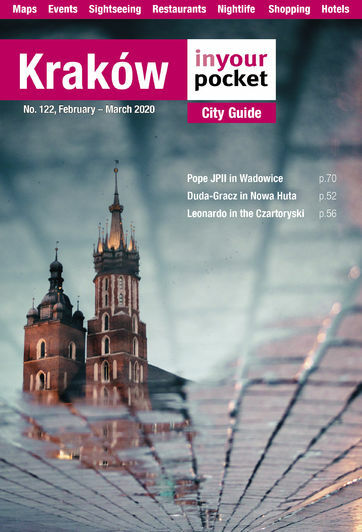 For a tangible copy of the embedded tour, order the current edition of our full print guide, which also includes regularly updated walking tours of Kazimierz (the former Jewish district), Podgórze (the area of the former Jewish Ghetto), and Nowa Huta, plus tonnes of other invaluable info.